Mankind has been teaching birds to talk for thousands of years. Man has also been using birds to deliver messages for just as long. But new research on the intelligence of birds suggests that they might be more intelligent than we suspect. Researchers studying pigeons have learned that they can read all of the letters of the alphabet and they read them in a way similar to people. 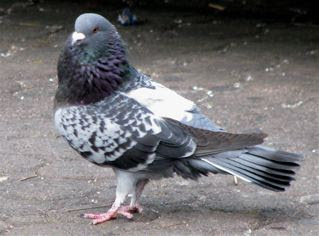 Scientists became convinced that pigeons see the world in much the same way as we do when they discovered that pigeons tend to confuse the very same letters that people do. What's more, it took only four months for pigeons to learn to distinguish all the letters of the alphabet. For years pigeons have been used to spot and reject defective items on assembly lines, where they have better records than human beings. Based on evolutionary theory, scientists naturally conclude that the recognition of abstract forms such as letters of the alphabet requires the larger brain. But this is an assumption and we might be reminded of the work of Harvard psychologist B. F. Skinner who made extensive use of learned behavior using pigeons. Brain size has little to do with intelligence. Real science and experience show this and disprove evolutionary views. The only alternative is that it is the Creator who gives His creatures their intelligence.